Buick présente au salon de Détroit sa nouvelle berline la Buick Lacrosse . Construite sur la base technique de la nouvelle opel Insignia, son style s'inspire du concept-car Invicta. 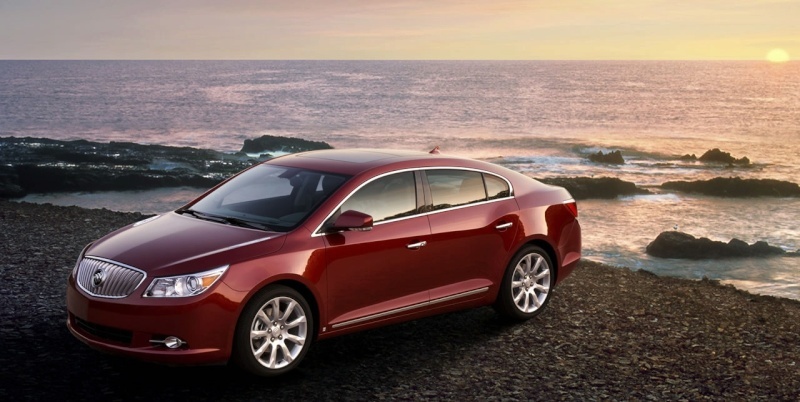 Redesigned from the ground up, the 2010 Buick LaCrosse luxury sedan makes its world debut at the 2009 North American International Auto Show in Detroit on Jan. 12. The LaCrosse offers all wheel drive, a suite of advanced intelligent personal technologies and safety features, and a choice of two fuel-saving V-6 engines. Buick’s long heritage of leading designs, such as the Y-Job Concept, the Roadmaster and the Riviera, helped define American automobile design through the years, according to Ed Welburn, vice president of GM Global Design. Today, Buick design is a product of a global team and resources. Creative collaboration between designers in the United States and China, in partnership with the Pan Asia Technical Automotive Center (PATAC) as well as chassis and body engineers in Europe, resulted in the first General Motors vehicle to be created on three continents. The exterior design is faithful to the Buick Invicta show car introduced at the 2008 Beijing Auto Show. “It is instantly recognizable as a Buick, with its signature ‘sweep spear’ body-side styling, portholes inside the character line on the hood, and waterfall grille,” added Welburn. Inside, the two-tone interior is defined by a flowing, uninterrupted design theme that wraps around the instrument and door panels. Attention to detail is evident throughout the interior, including the analog instrument cluster, chrome offset by dark wood accents, and the contrasting thread and French stitching on the instrument panel. Buick’s signature QuietTuning – an engineering process to reduce, block and absorb interior noise – provides a distraction-free passenger environment. An unexpected, inviting touch is the cool blue ambient lighting throughout the cabin from the center console, instrument panel and door panels. The contemporary atmosphere of the cabin includes the digital connectivity and personal technology offered in the new LaCrosse. That includes features such as in-dash navigation, Bluetooth connectivity, an auxiliary audio input and a USB port. For rear-seat passengers, a power rear-window sunshade and a DVD entertainment system, with two display screens integrated into the seatbacks, is available. LaCrosse’s intelligent technologies also work to deliver a 360-degree field of vision behind the steering wheel, for a greater feeling of comfort, security and safety. It starts with the available head-up display in the windshield, allowing the driver to monitor speed while keeping his or her eyes on the road. At night, the available adaptive lighting package can direct the high-intensity discharge headlight beams up to 15 degrees for enhanced illumination of the road and its curves. LaCrosse offers Side Blind Zone alert that notifies the driver if a vehicle in adjacent lanes is traveling in the driver’s blind spot. The LaCrosse is also available with a rear view camera, with the display integrated into the navigation system screen. The technology available on LaCrosse enhances a suite of standard safety features that is designed to meet the criteria for the National Highway Traffic Safety Administration (NHTSA) 20 Star Safety Rating. Highlights include front-, side- and roof-mounted head-curtain air bags, StabiliTrak stability- and traction-control system. The safety and security of OnStar is also included for the first year of ownership. LaCrosse’s stiff body structure serves as the foundation for precise suspension tuning, safety and a quiet ride. Buyers can choose from a family of efficient, direct-injection six-cylinder engines and a fuel-conserving six-speed automatic transmission with tap-up/tap-down control. The direct injection engines in the LaCrosse create more power with less fuel and reduce vehicle emissions through greater combustion control – particularly cold-start emissions that are reduced by up to 25 percent. * CX – equipped with a new 3.0L direct injection V-6, premium cloth seats and 17-inch wheels. The 3.0L engine generates an estimated 255 horsepower (190 kW) and 211 lb.-ft. of torque (286 Nm) and is mated to a six-speed automatic transmission. * CXL – also equipped with the new 3.0L direct injection V-6, adds leather-appointed heated seats, dual-zone automatic climate control, fog lamps, outside rearview mirror with LED turn indicators and puddle lamps, and 18-inch wheels. Intelligent AWD is available. * CXS – equipped with a 3.6L direct injection V-6; real-time active-dampening suspension; perforated, leather-appointed, heated and cooled seats, and chrome-plated 18-inch wheels (19-inch optional). The 3.6L engine, mated to a six-speed automatic transmission, generates an estimated 280 horsepower (209 kW) and 261 lb.-ft. of torque (354 Nm). LaCrosse production will begin this summer at the Fairfax Assembly facility in Kansas City, Kan.